Industry was a New Wave Synthpop, Industrial band formed in New York. On establishment, it was known as Industrial Complex. Name was changed to Industry in 1981 and disbanded three years later. There best known album was titled Stranger to Stranger in 1984 and their well-known single, "State of the Nation" taken from the album. 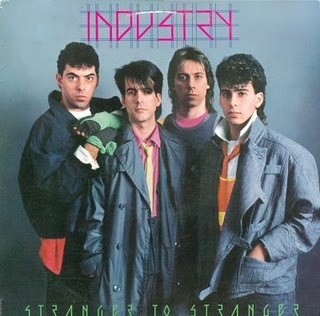 Industry was founded in 1978 by guitarist, composer and studio engineer Andrew Geyer, drummer Mercury Caronia and vocalist Sean Kelly as "Industry". Caronia and Geyer worked with experimental electronic music, odd time signatures, tape loops, synths, and innovative guitaring into various methods of recording. In 1981, Andrew Geyer left the band. Guitarist Brian Unger, new lead singer Jon Carin and Rudy Perrone (who was previously in a progressive rock band called Cathedral, with Mercury) joined the group, now called Industry. They signed in to Capitol Records. Their best known single, "State of the Nation", broke through the European charts between 1983 and 1984, earning them a place as support for acts like Billy Idol, Talk Talk and INXS. The second single from the same album, "Still of the Night" was less successful. The band split in 1984. After the split, Jon Carin started a successful session-man career, becoming a permanent member of the Pink Floyd live band and co-writing Pink Floyd's hit single "Learning to Fly". Unger and Perrone went on to form their own bands.